Deskyong Namgyal, Principal, EJM, College, Leh: It is extremely important to have a university in Ladakh. The reason expressed by the representatives for not considering a university in Ladakh is due to less population. Our voice and demand are least regarded and have repeatedly been overshadowed by the J&K state. During the recent visit of the J&K Governor, the demand for Cluster University was discussed but sadly, the demand was outrightly disagreed. The absence of University causes major challenges for the student. They have to migrate to other places for higher studies and face many problems like harassment and others. Even if two out of 100 students are being harassed that is also a major concern. There are hostels opened by the government in Jammu and Srinagar while in other places such facilities are not available which force them to live in rented apartments. The existing hostels cannot accommodate all. The central heating system that we have in the hospital, the same can be equipped in libraries, if not in the classes. Such basic facilities are needed. In India or in other states, the major emphasis is on the smart class in college. And here we do not have such facilities due to lack of funds because the college gets a meager amount from the district funds. The education system must be considered a priority. If the major funds are also used for the development of education, soon the challenges can be overcome. In J&K the majority of the colleges are not National Council for Teacher Education (NCTE) accredited. In higher education, the main agenda is to have the NCTE accreditation and we are working on the same. Hopefully, in the coming summers, the NCTE team will come here and give us the accreditation and then the college will get the UGC funding. The students studying outside Ladakh who is sent to hostel or boarding schools from a very young age face an identity crisis. To prevent such problem the school in Ladakh should have good facilities though it has improved over the years. Most importantly when a child stays here he will be able to see the hardship and challenges that parent face while earning money and will understand all the aspect. With the establishment of the university and good higher education institutes, job opportunities will also increase. We have been witnessing that the people from other places come here and do research. In no time they get recognition. It is high time that our own people should come forward and start researching in Ladakh. All these things will be possible if we are granted with a full-fledged university. Besides academics, there are many scopes where students can do research. The reason behind not having a university is not because Kargil and Leh lack unity. But, in the future, if we come up with a university then there are chances of an argument over its location. Supposedly, if the university is granted, leaders from both the district should come together and make a fair decision. People of Leh and Kargil must stay united and demand the university and decide the parameters as per the region. At the council level, getting a university must be a priority. Both the council of Leh and Kargil district and the entire representative must work upon getting the demand fulfilled. But unfortunately, the issue has never been taken seriously. For now, there is a sign of relief for the students studying in Leh and Kargil. Vice Chancellor of the University of Kashmir has introduced a sub-centre in both the district and a separate academic calendar. Hopefully, in the coming month of March, things will be sorted out. • Priority must be given for the development of the education system. • The leaders of both Leh and Kargil should come together and demand a University. Dr. Tsewang Motup, Principal/ Nodal Officer, Govt. Degree College, Nubra: Keeping in view the exceptional geographical, historical and cultural background of Ladakh, it is necessary to have a full-fledged university in Ladakh. The state of Jammu and Kashmir comprises three distinct regions viz, Jammu, Kashmir, and Ladakh. In 2009, when the Government of India announced the establishment of a Central University in Jammu and an Indian Institute of Management (IIM) in Kashmir, the people of Kashmir valley protested against the central Govt’s decision and demanded a Central University in Kashmir as well and the Central Government conceded their demand. But I remember none such demand was made by the people of Ladakh. The Universities in Jammu and Kashmir regions have many feeding colleges in their catchment areas. However, we Ladakhi prefer to send our children outside Ladakh to pursue higher education. This is clear from the number of students studying in various schools, colleges, and universities in the country. It has never been on our political or social agenda to establish a university in Ladakh. The colleges and university campuses functioning in the twin districts are not in a position to accommodate all the students who pass out from the higher secondary schools due to one or the other reasons. I have never heard local administration or any public representative demanding a University for Ladakh till so far except for some student organisation. The students and their parents must understand that instead of going to the colleges outside, they should enrol themselves in the college of Ladakh. That will automatically force the government to create an institution of next level of learning in Ladakh itself. Higher education is given least importance by the people at the helm of affairs in Ladakh. 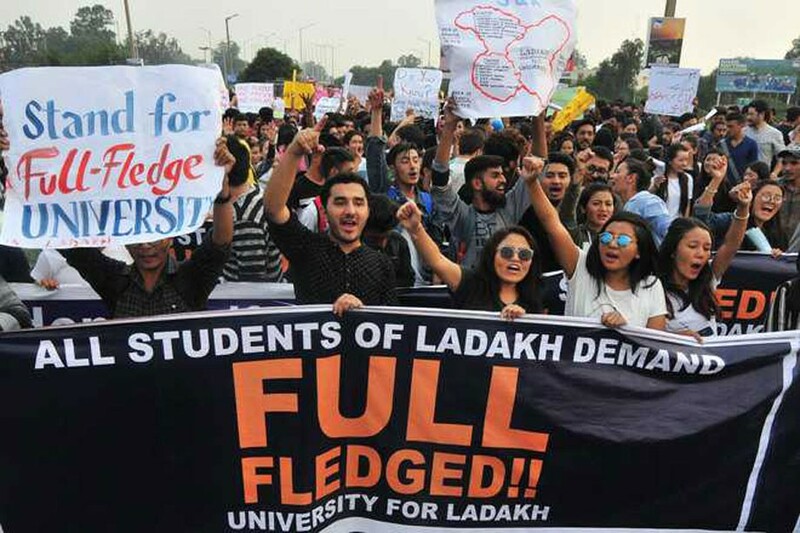 In any of the memorandum submitted by various organisations during the visits of VVIPs to Ladakh, one will not find anything about the university. The whole examination system of the University of Kashmir has been derailed since the year 2014 when there was a devastating flood in the Kashmir valley. In the subsequent years, the political situation of the Kashmir Valley was not as good as a result the examination system in our college was adversely affected as well. It is unfortunate that three batches of students are suffering. But it is hoped that this system will not be repeated in future with the recent announcement made by the Vice Chancellor of the University of Kashmir that the examination system in Ladakh shall be delinked from the Kashmir University and launching of an Examination Sub-Centre for Leh at the University Satellite Campus, Taru. More and more Ladakhi scholars should do research on all aspects of Ladakh. The enrolment in the institutions of higher education in Ladakh should go up so that the demand for a university may sound logical. Parents must consider the pros and cons before sending their children outside Ladakh.